Christian Singers can now proudly proclaim their faith while displaying their other passion - MUSIC! 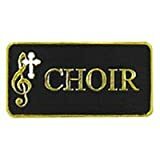 This Christian Choir Lapel Pin features a sleek, classic design with the word "Choir" in gold color lettering alongside a Treble Clef with a white enameled cross on left side. A gold color trim frames the pin in an elegant fashion. Great gift for a choir member, music minister, or choir director! Metal plated lapel pin. Approx. 1" W x 0.5" H.